So how do you relist your home in NYC to have it appear as a new listing? Changing your listing agent is commonly believed to be the simplest way to reset your days on market in NYC. However, depending on what kind of exclusive listing agreement you signed, there may be some difficulty in canceling your contract. Pro Tip: Even if you have tough listing agreement language that prevents early termination, you can still in practice force the agent to terminate by refusing to make the property available for showing. You could also complain to the agent’s manager. A combination of these actions will typically result in the brokerage agreeing to release you from your listing agreement. Hauseit believes listing agreements shouldn’t be so onerous. For our customers, all of our broker affiliates use modified listing agreements with language that protects home sellers from situations such as commissions being earned without a closing having occurred or preventing homeowners from relisting their home with a different broker prior to expiration. All Hauseit customers can terminate their listing agreement by simply sending an email to us or our affiliate listing broker. What if you are selling for sale by owner and don’t have a listing agent? Just because you’ve decided to sell FSBO in NYC doesn’t mean you can’t relist your home in NYC! You can still avoid paying the standard 6% broker commission by re-listing with an Agent Managed FSBO, otherwise known as a flat fee RLS listing. Your home would appear as a brand new listing with zero days on market. Best of all, it will appear as a traditional for sale by agent listing in RLS (i.e. REBNY Listing Service which is the equivalent to the NYC Multiple Listing Service), StreetEasy, Zillow, Trulia, Brownstoner and many more popular real estate search websites. With a flat fee RLS listing, you are only responsible for paying whatever commission you’ve chosen to offer to buyers’ agents if you end up closing with a represented buyer. You receive all inquiries and are free to cancel anytime simply by sending us or your listing agent an email. You can choose to do nothing at all or sell to a unrepresented buyer and never owe any broker commission. What if I want to reset my days on market for my flat fee RLS listing? 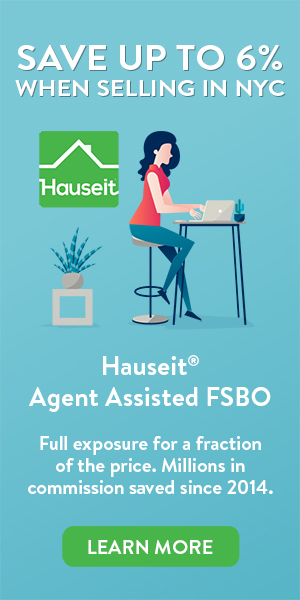 Because Hauseit has many, independently operated brokerage affiliates, switching flat fee RLS listing agents is quite easy. If your listing agreement has expired or if you simply want to change listing agents because you feel that your listing has sat too long on the market, you can simply re-order our flat fee RLS listing product for the same, low one-time flat fee. 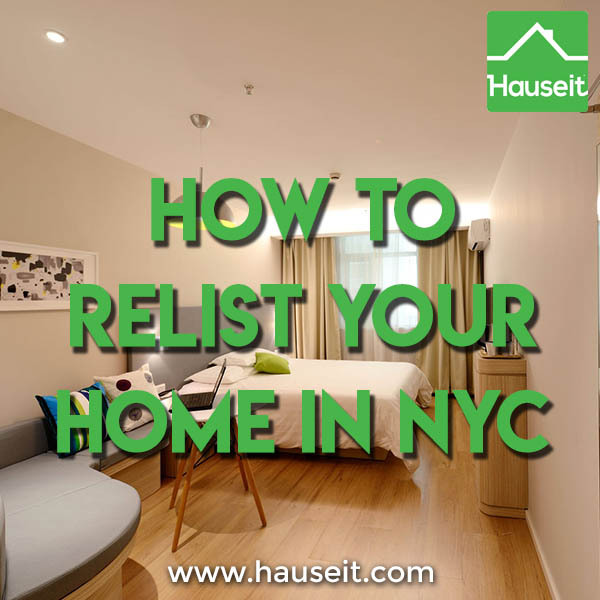 Your existing listing will be de-listed the same day so you can relist your home in NYC with a different Hauseit affiliate within two business days. Note: Even though your day count on sites like StreetEasy will reset to zero, this does not remove the listing’s action history (i.e. prior sale, listed, price reduced, de-listed etc) in most cases. If you really want to relist your home in NYC under the same listing agent or yourself if you are selling FSBO, then the only way to reset your day clock is to take your property off market. How long you must take your home off market varies by the specific rules of each search portal; however, you will need to be off market for at least three months because that is the current threshold for a listing to appear as new again on StreetEasy, the most popular real estate search website in NYC. Relisting your home any sooner than 3 months will defeat the purpose as your listing will simply re-appear on StreetEasy with a much longer day count (i.e. including the time you were off market). There are only two officially sanctioned ways to reset your days on market on StreetEasy. The first is to switch listing agents and the second is to take your property off market for 3 months. If you are intent on selling it yourself through a traditional FSBO, then you will have no choice but to wait 3 months before relisting it by owner. However, real estate agents have been known to find ways around this issue by either tweaking the way the property address is written (i.e. Apartment 4B vs 4-B or South 10th Street vs S Tenth St) or even by re-listing it temporarily with another agent within the same brokerage. We have witnessed situations where a broker was able to reset the days on market to zero on StreetEasy by taking a listing off market and re-listing it later that day under one of his salespeople. Once the day count was reset, the broker swiftly replaced the salesperson with himself with no ill effect on the newly reset day count. Hauseit doesn’t condone any of these alternative methods to reset your days on market on StreetEasy as it can be construed as intentional obstruction of data accuracy. WTH… this listing went off market yesterday, then came back today as #B3 (as opposed to #3B). Listing history gone (used to be 51 days on market). 118 Greenpoint Avenue #3B. Is this normal? Is days on market not reliable? Hi Ryan – yea this is a sneaky trick done by listing agents sometimes to reset the day count. Listing agents can get it past StreetEasy by changing the address format slightly. So days on market is not always reliable, it’s good to check the past sales for the building to see if there are any old listings for the same unit! Resetting your listing’s day count won’t do all that much by itself if your listing is flawed. The most common mistake FSBO sellers make is in not investing in professional photography, having an overpriced listing and not engaging buyers’ agents with a flat fee RLS listing. The number one mistake traditional FSBO sellers make is in alienating buyers’ agents. This is mainly due to lack of basic knowledge about how the real estate industry works. Had they done some precursory research, they would have quickly realized that 90% of all buyers in NYC are represented by agents. So no, don’t even think about writing “no brokers” or “principals only” on your listing. Ironically, there’s no need to because agents with real buyers would never risk directing their clients to your listing in the first place. Each buyer client is extremely valuable and worth typically 3% in commission, why would they risk suggesting a FSBO listing where they could very easily get dis-intermediated? Unfortunately, many traditional FSBO sellers mistake the amount of Realtor inquiry they receive as real interest in purchasing their home. One of the main downsides of listing as a traditional FSBO is the intensity of the solicitation you will receive from junior agents trying to “get your listing.” You will receive literally hundreds of cold calls from junior agents assigned to solicit all the FSBO sellers on the market. You will receive repeat calls from the same junior agents you turned down yesterday. After all, they are determined and have nothing to lose! Avoid broker solicitation and engage every buyer’s agent with a flat fee RLS listing! Your listing will appear under an independent, REBNY Member Firm with a full-service reputation. Benefit from the full-exposure of a traditional listing without the traditional 6% commission! This is largely self explanatory; however, we constantly see customers submitting low resolution, slanted cell phone camera photos that they took themselves with poor lighting. Not only is it extremely embarrassing for our affiliates to have to post listings with these photos, it shows terrible judgement on the part of the home seller. If you are selling a million dollar home in NYC, why on earth would you skimp on $300 for professional photographs? Photos are the first thing almost all home buyers see unless they are being led around on an open house tour by their agent. Why would you give a terrible first impression of your home? A picture really does speak a thousand words, especially so in real estate. You should absolutely lower your listing price before you relist your home in NYC. You should do it even if it’s a minor $10,000 price reduction. As the CEO of Douglas Elliman once admitted, a listing will sell no matter which brokerage lists it if it’s priced correctly. Yet having an unrealistic listing price is the primary reason why FSBO sellers need to relist their homes in NYC. Unfortunately for many FSBO sellers who become discouraged, they end up being pressured to sign a traditional 6% commission exclusive right to sell listing agreement. What does the agent do differently after getting the listing? Reduce the listing price, take professional photographs and list them on RLS if they hadn’t purchased a flat fee RLS listing package. We’ve seen this time and time again. A FSBO seller lists too high and didn’t bother to order professional photographs. At the end of three months they acknowledged that they messed up big time and feel like they have no other choice but to pay full commission to a traditional agent. Now you know that there’s another way! You don’t have to pay 6% commission just to relist your home in NYC. Sign up for an Agent Assisted FSBO and reset your day count on StreetEasy and other popular real estate search websites! 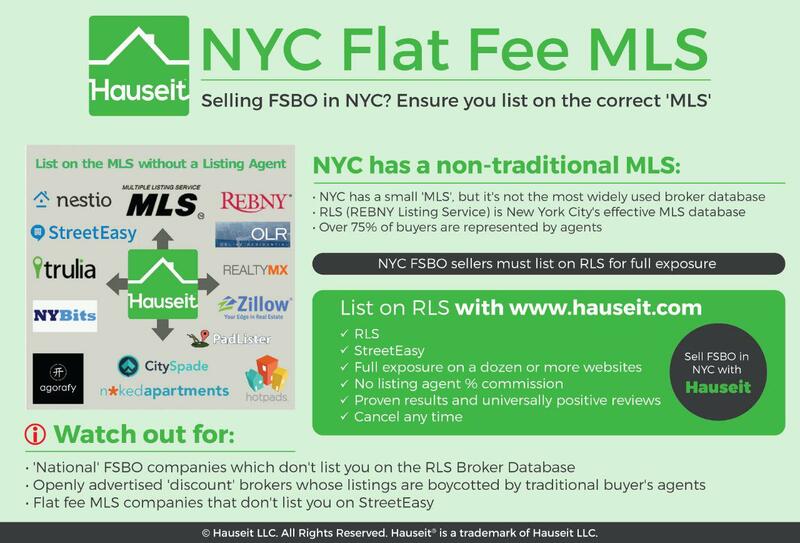 And even if you’ve been listed too long under a Hauseit affiliate, now you know it’s quite easy to relist your home in NYC under a different affiliate or even with the same affiliate to reset your days on market to zero!